I have to admit, I always judge books by their covers and the content always seems to live up to the cover image. This is certainly true of Nigel Farndale's The Blasphemer. Its cover is a mesh of music, war, people, travel, and a turtle. This is a pleasing graphic summary of the content of the novel which weaves parallel narratives through space and time via classical music, World War 1, family lineages, mysterious strangers, tragedies and travels, not forgetting the turtle! The narrative is split primarily between Daniel Kennedy's life in present day London, and Private Andrew Kennedy's life as a World War 1 soldier in France. Daniel Kennedy is passionate, young, modern and troubled. On the outside, Daniel is a staunch atheist achieving international fame for his godless philosophy and for a newsworthy act of heroism. On a personal level, however, Daniel struggles with the consequences of cowardice and the experience of a (possibly religious?) vision. Private Kennedy is Daniel's great grandfather and his story is breath-taking. His journey from solider to survivor, via tragedy and accusations of cowardice is truly beautiful, and the subtle links to Daniel and the 'present day' storyline do not patronise the reader. In fact, there are so many subtleties and nuances that I was desperate to re-read the book immediately to uncover the references I must have missed first time round. I love narratives that weave in and out of each other. Farndale's 3rd person narration allows the reader into the very depths of each character's story. The narrative viewpoint chops and changes between characters at crucial moments of revelation, leaving the reader trapped in suspense for the entire novel. In addition, minor characters are allowed to flourish with their own storylines throughout the novel, meaning that there is always a new perspective just around the corner. Farndale introduces new perspectives right up to the last stages which builds, in equal measure, excitement, momentum and frustration. Although I have identified Daniel and Andrew as the protagonists of the novel, Farndale has developed a satisfying variety of characters and has placed them in their own unique cultural, historical and emotional contexts. There are simply so many characters in The Blasphemer (most of whom play critical roles in the multi-layered narrative) that it is impossible to identify the most important ones. The characters are finely interlinked with each other's lives, and so one character just would not be the same without another. Farndale's attention to detail in his ability to relate the characters to each other to the point that their livelihoods depend upon each other's decisions and actions creates a thoroughly well executed novel. My favourite character is Whetherby, an old, complex and eccentric bitter Catholic who is malicious and selfish. He is the Vice Provost at the university where Daniel is a lecturer. Whetherby's sinister, deceitful nature propels the plot and makes for gritty, enjoyable reading. He's the 'baddy', but not a fairytale baddy; he's very real, believable, and therefore terrifying. His actions are shockingly immoral and a joy to read about! The evil undertones that Whetherby provides are a perfect backdrop for the debate between theists and atheists which occur throughout the novel. There are a few elements of this book that really made it stand out from other novels I've read recently. Firstly, I loved the revelation that both Daniel and Private Kennedy, three generations apart, were in equal measure cowards and heroes. Farndale's exploration of this incongruity fascinated me because of the impact these two labels have on reputation and personal relationships. Farndale expressed this tension within and between the characters superbly and, on the whole, indirectly. Instead of directly referencing the tension, Farndale creates a subtle yet clear atmosphere for the reader to pick up on. I really appreciate this approach; the skill it takes from the author and the authority it gives to the reader. I also enjoyed the common factors in both the World War 1 narrative and the present day narrative. Daniel and Andrew shared a family bond and the battle of hero vs coward. They were also guided by a mysterious vision, and both triumphed in adverse circumstances. But their lives are linked by more obscure elements, like Mahler's 9th Symphony and a turtle shell. These elements don't just exist to create a link between past and present, but they travel through time and evolve to have a new impact in their new context. Farndale evolves these inanimate objects through the generations and they begin to play a part in the story. In fact, they are so important that they change the lives of the characters. Another element that I loved was the major significance the minor characters play in the plot development, particularly Hamdi and Major Morris. I'm not going to explain much about these characters because I don't want to ruin their ethereal presence and mystery within the novel. Farndale devoted very few 'column inches' to them, but they are the most haunting characters in The Blasphemer; their mystery and complexity sticks in your mind after the last page of the novel. Farndale is clearly skilled in creating well-rounded and intriguing characters. I also really enjoyed some rare but brilliantly funny moments of situational comedy. The most cringeworthy being an awkward meeting Daniel has to have with his daughter's class teacher regarding his daughter giving her teacher gifts and cards. Daniel has to endure this meeting knowing that he is the anonymous gift-giver, not his daughter! His partner Nancy concludes the meeting my saying 'We'll have a word with her [Martha]', all the while Daniel is squirming with embarrassment. The characters wrestle with moments of heroism vs cowardice; belief vs scepticism; and love vs self. They are all engaged in a battle of ideas and consequently Farndale has executed deep, engaging and realistic dialogues between characters. 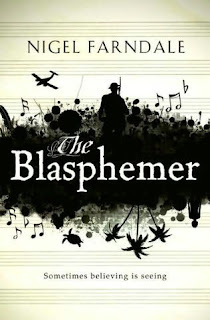 So, if the cover of The Blasphemer catches your attention, pick it up and read it! You will find within its pages great characters and conversations; moments of revelation, hope, despair and unity; a plot to really get you thinking and a desire to read it over and over again. Sounds like a wonderful read. I like complex stories like this, as it keeps me engaged & wondering what's round the next corner or popping up from "nowhere". One of Mario Vargas Llosa's novels was rather like that; I wasn't always sure if I was in the present or the past. Wherever I happened to be, it was fascinating. George Polley, author of "The Old Man and the Monkey" and "Grandfather and the Raven"
I agree George it's good to have a novel that treats the reader as an intelligent species. Just finished reading the book and am wrung out with tears. Fantastic reading and how I hated Whetherby! Thank you Nigel Farndale for a wonderful read. Fabulous - another Sebastian Faulks in the making! Just finished reading this novel............Thought it was a bit slow and complicated at the beginning .....but Oh!! how it grips you and draws you in. A great read.